#10. 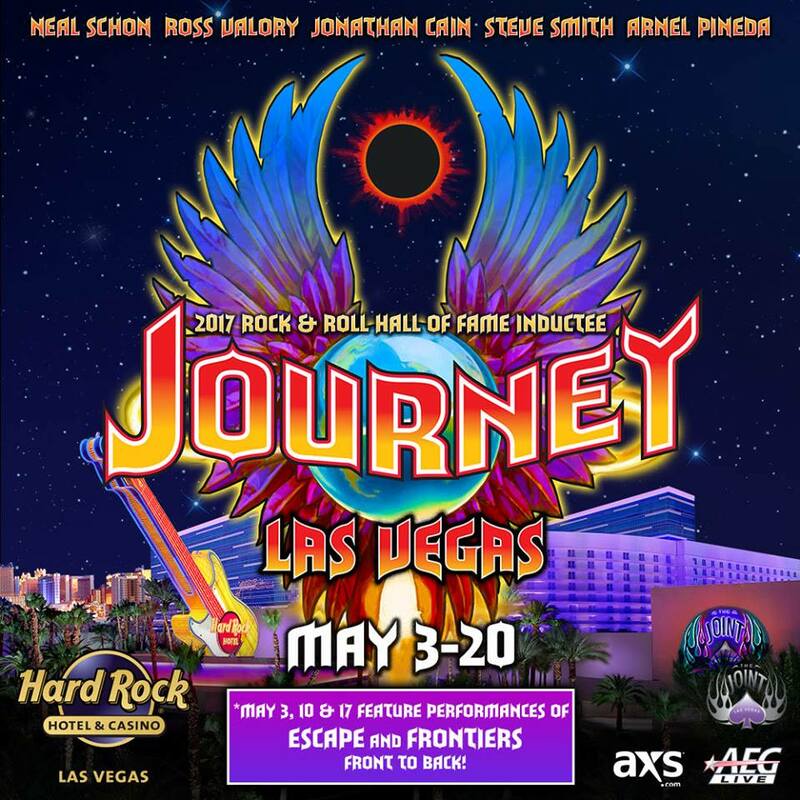 Journey @ The Joint, Las Vegas NV, 5/3: I have to admit, I was begrudgingly dragged along to this show, having to get into a plane for the one hour ride into Vegas to catch Journey perform the ‘Escape’ and ‘Frontiers’ album in their entirety. My brother, who literally dragged me to the show, as a sort of payback for having to drag him along to Psycho Las Vegas later in the year, made the whole trip worth it in the end, and it ended up being a show for the ages. Journey, the historic rock band with universal hits in ‘Don’t Stop Believing’, ‘Faithfully’, ‘Wheel in the Sky’, and more, performed their two iconic albums during their residency at the Joint on the fateful Wednesday evening. What made this evening even more epic was Neal Schon’s guitar playing. I have seen Journey a few times in the past, but this performance was utterly breathtaking. Frontiers and Escape are easily Journey’s strongest albums, and hearing them front to back in such an iconic fashion made the experience wholly timeless. #9. 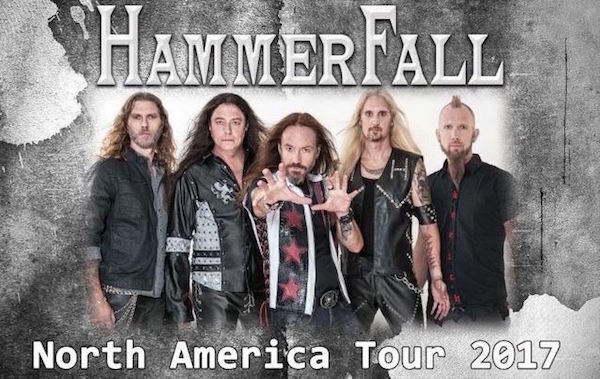 Hammerfall @ The Grove of Anaheim, Anaheim CA, 5/10: I felt like a kid waiting for Christmas as I crossed out each day from the moment I secured my tickets until show day. HammerFall, easily one of my favorite bands of all time, was coming into town with a respectable power metal package featuring co-headliners Delain. With such a low turnout in relativity to the venue, I could not believe not more metal fanatics are as diehard for Hammerfall. It must have been that Sabaton was performing the following day in the same exact venue; so many fans of power metal were left with deciding which one to see. Well for those who missed this show, they certainly missed out. HammerFall, performing for a little over an hour, played all the right songs, featuring tunes from their recent installment ‘Built To Last’ and several of the band’s greatest hits. I sang at the top of my lungs as each song flowed into another, and I felt like a kid on Christmas day when they performed my favorite song of theirs, ‘Let The Hammer Fall’. When word got out that this band was performing again in my hometown next year in January, I did not skip a moment’s notice to secure my tickets for their second go around promoting their new album. #8. 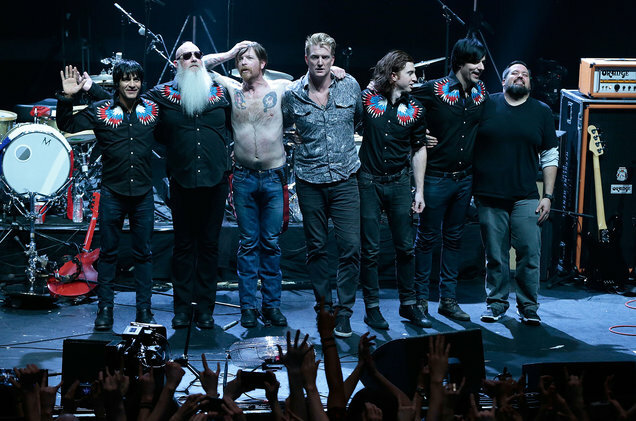 Eagles of Death Metal @ The Palladium, Hollywood CA, 4/20: To be honest, I had absolutely no idea who this band was, other than the fact that one of their shows in Europe fell victim to a terrorist attack and they were on the news. They followed the post-rockers Russian Circles, and to much surprise, they came out all guns blazing. They performed with such incredible stage presence. 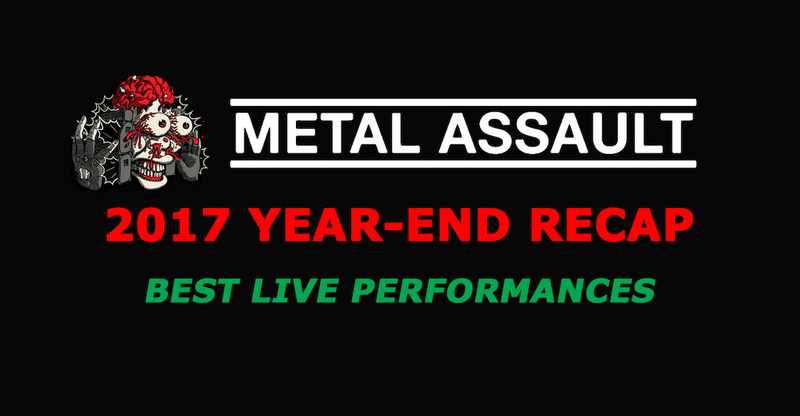 Their frontman, clad in a white and red jumpsuit, hopped and skipped all over the massive stage of the Palladium, rocking out with his guitar and belting out admirably the tunes ‘Silverlake’ and ‘Complexity’. At first I did not want to like them, but by the end of their 40-plus minute performance I left a huge fan. 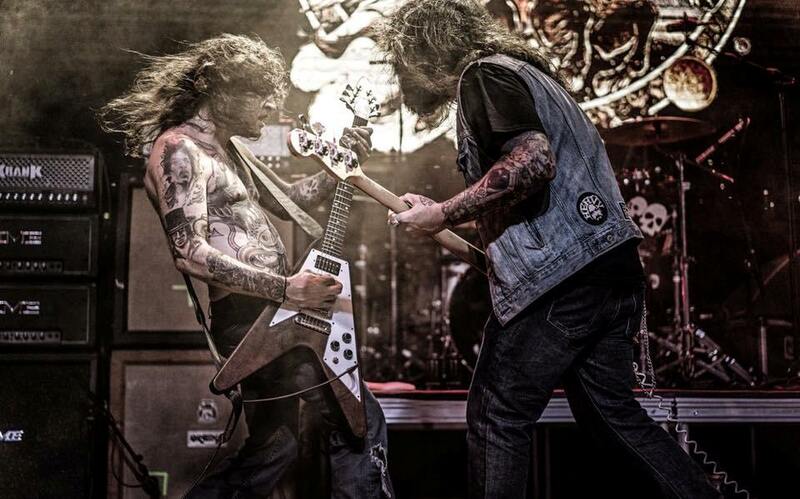 The band easily stole the show right under from Mastodon, and won over many new fans in the process. They also performed with fervor, a cover of the late great David Bowie, ‘Moonage Daydream’. A charming touch to round out their setlist. It was actually this performance that compelled me to catch them again their second go around in Southern California when they performed at the House of Blues in San Diego with the same package. Again they easily bested Mastodon that evening. #7. Mothership @ The Joint (Psycho Las Vegas), Las Vegas NV, 8/18: Once again, this band was such a sweet surprise to me, as I had no idea who they were when I first laid eyes on them when they graced the massive stage of The Joint, located at the infamous Hard Rock Hotel off the Las Vegas strip. My brother and I had just wrapped up stuffing our faces from a hearty lunch, and we rolled in as the Dallas rock and rollers, a three piece, filled the arena with such a massive sound. 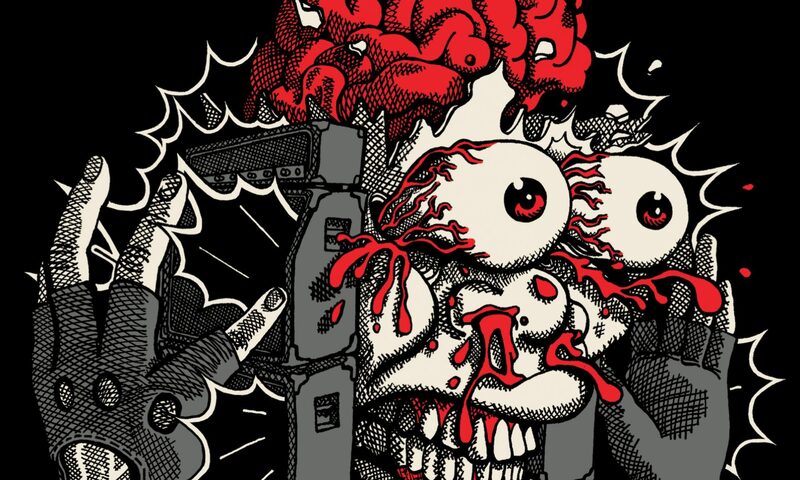 The whole time I watched in joy, as if I just had discovered a rich mine of unrefined gold, as the stoner rock trio performed songs off their 2017 album ‘High Strangeness’ and much more. It was actually this performance, where I finally felt compelled to delve deeper into the burgeoning doom rock/stoner scene, as I was initially put off by it. It took this performance for me to finally understand what the hype is all about. What made this moment so surreal, as if it felt like a scene from a movie, was that I actually was incredibly fortunate to meet the guys in person, when we were given the chance to open up for them at the Soda Bar in San Diego later in the year. The ranking is so high given the absolutely genuine character of each person in the band. They were easily approachable and inspiring. Keep up the hard work, fellas! #6. 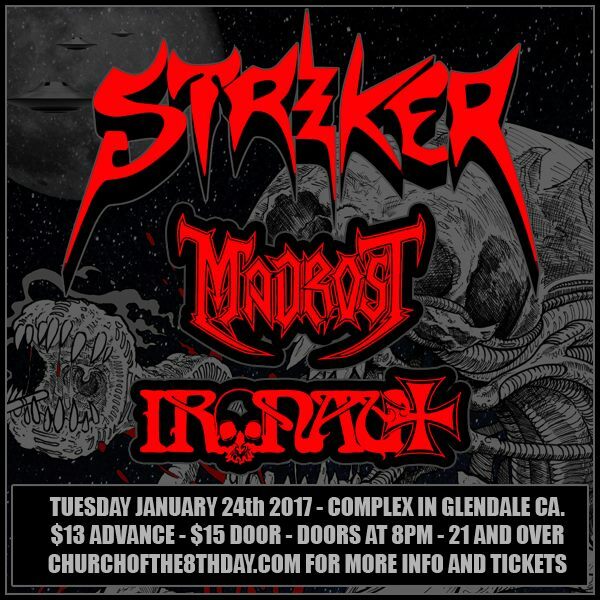 Striker @ Complex, Glendale CA, 1/24: I first discovered this band back in early 2016 when I put on Spellcaster radio on my Spotify app and the song ‘The Iron Never Lies’ graced my playlist. The song, coming from their world class LP ‘Stand in the Fire’, was an instant hit in my eyes, as I frantically ran across the room to open up their artist profile in said app. I immediately put on the record, and I was sprung, like a summer fling that came and went, but in this instance it never left. For the remainder of 2016, I listened to the album for what it seemed like a million times, hopefully earning them enough royalties to pay for their follow up, eponymous production. When I first heard that they were going to play a show in the Los Angeles area, I snatched up two tickets and dragged my brother to the show. Holy Toledo steel, was this band everything that I could have imagined live, but better. I have no idea how they managed to fit a five piece band on that small stage, with all their gear and microphones to boot. Their headlining set was full of songs from ‘Stand in the Fire’ and some of the more deep cut gems from their earlier albums. They also unveiled a new song from their upcoming album, which was well received by the smallish Glendale crowd. I was so stoked after their show that I bought the ‘Stand in the Fire’ LP and chatted with the drummer for a bit.